Southeast Pools, in Kissimmee, Fl is dedicated to providing the highest level of professional residential swimming pool cleaning & service . At Southeast Pools, we customize our residential swimming pool services to each home swimming pool, and provide swimming pool cleaning service plans on a weekly, bi-monthly, and monthly basis. Keep your home swimming pool in Kissimmee, Fl clean and hygienic for you and your backyard guests by letting Southeast Pools handle your residential swimming pool cleaning & maintenance needs. A dirty swimming pool is not one you are going to enjoy. Improper or irregular cleaning of your residential swimming pool can further create costly maintenance and service issues that could otherwise be avoided. At Southeast Pools, we take care of the pool skimming, pool vacuuming, brush the pool tiles, clean pool filter baskets, and take care of all the swimming pool cleaning needs required to ensure you enjoy your oasis. When you choose Southeast Pools to handle cleaning for your home swimming pool in Kissimmee, or surrounding areas, you can rest easy with the knowledge our fully customized swimming pool cleaning plan will provide the highest level of cleanliness. The staff at Southeast Pools are trained, licensed, and fully insured pool technicians who will help you determine the best residential swimming pool cleaning schedule for your home pool or hot tub. At Southeast Pools, we do more than just clean your pool. 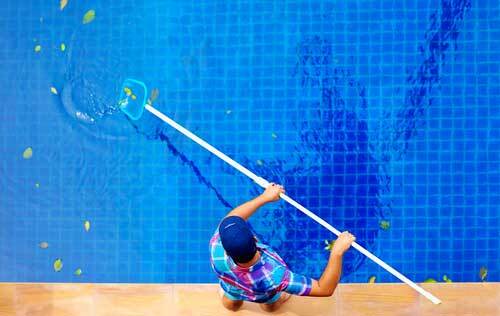 Our swimming pool cleaning plans include full-service pool maintenance as well. With Southeast Pools residential swimming pool cleaning & maintenance, your home swimming pool will be vacuumed, scrubbed, brushed, cleaned, and have proper chemical & ph balance.. When you hire us to clean your home pool in Kissimmee, Fl, you are hiring a team that will handle all of your residential swimming pool cleaning needs. Whether your home pool is open-air or an enclosed residential swimming pool, our cleaning & maintenance technicians can handle the job. Contact us today and let a certified member of Southeast Pools visit your residential swimming pool in Kissimmee, Fl to determine the best pool cleaning & maintenance plan for you. When you meet with us, we can determine how often services will be needed, the chemicals required, and the time it will take all so we can provide you with a competitive quote for your residential swimming pool cleaning needs. We will never charge hidden fees or extra costs.